Officially known as American league Park, this field, this first home of the then NY Highlanders was dubbed Hilltop Park by newspapermen. The team played at this park until 1913, when they officially became the Yankees and a sub-tenant at the Polo Grounds. 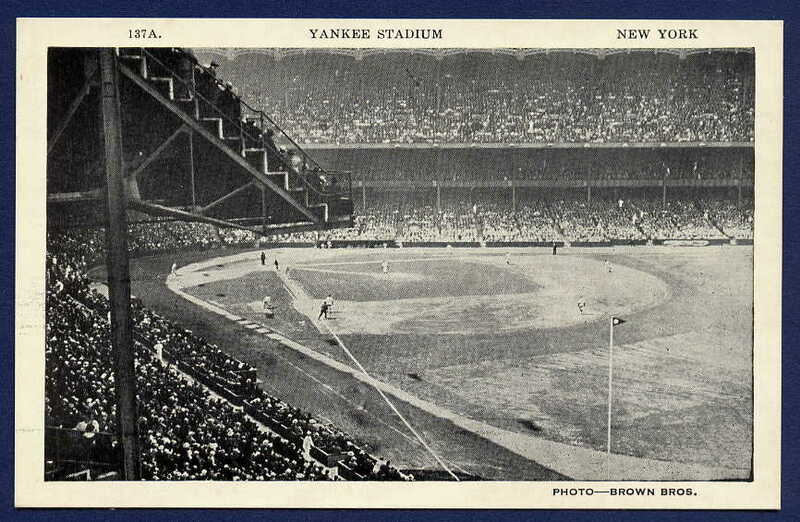 Another early Yankee Stadium card, reproducing a photo taken at the park's opening day in 1923. 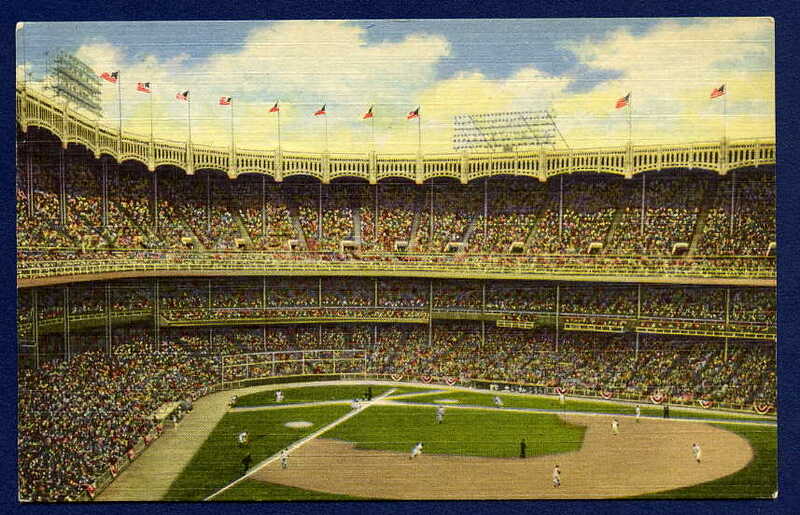 The same artist rendering of a fully- enclosed field (as in card at top right) is seen in this card in an inset. 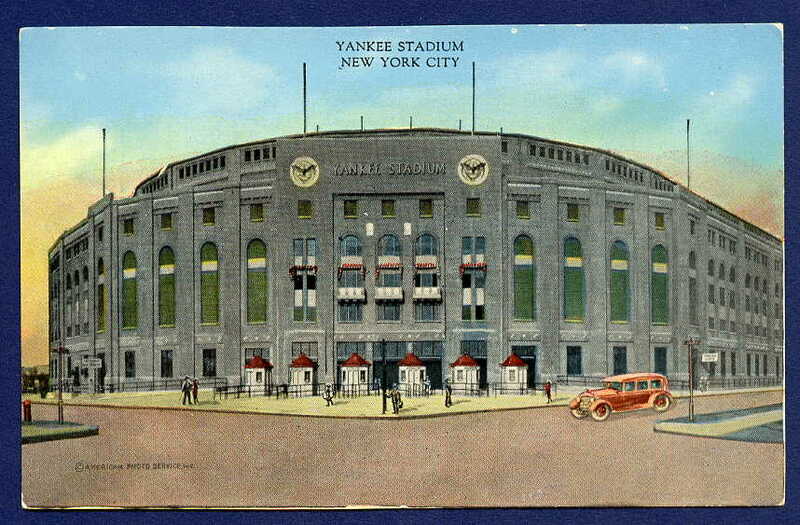 This early pre-linen card, published by Manhattan Post Card Co and featuring a photo by American Photo Service, Inc. A terrific car is seen in front of the venerable stadium. This image is slightly different than the other stadium card featured above, right. 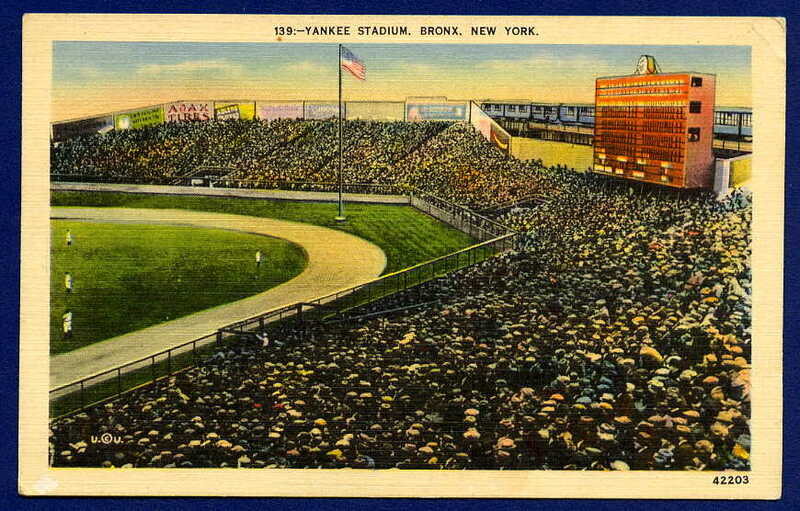 This postcard, published by Haberman's was issued in 1923 and includes a number of fans and different flags and clouds. 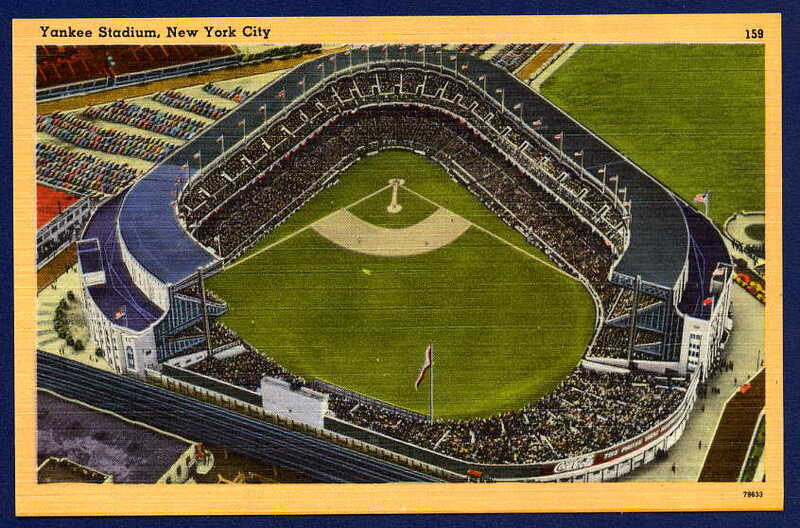 Another Manhattan Post Card Co. linen of the stadium, as seen from right field. No issue date or postmark, but a classic 1930s-1940s image. 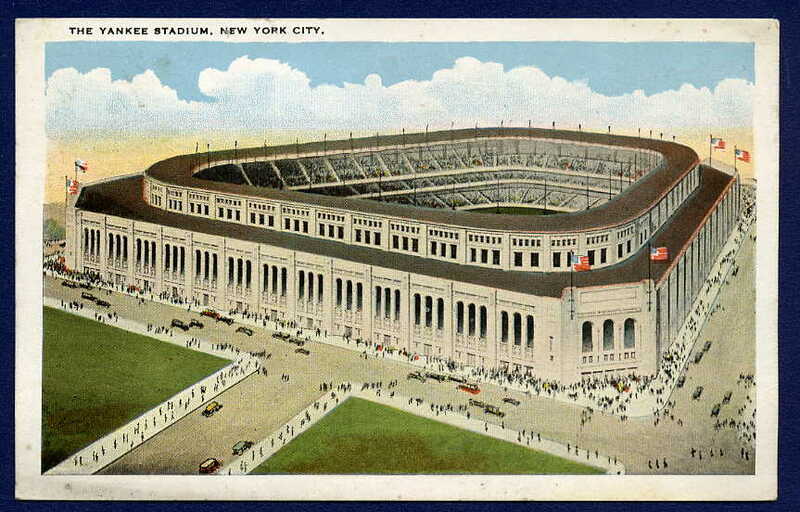 This card showcases an architect's rendering of the new Yankee Stadium -- complete with fully-enclosed stands...a feature which did not make the leap from drawing-board to construction. This Union News Co.card was postmarked in 1925, though issued before 1923. 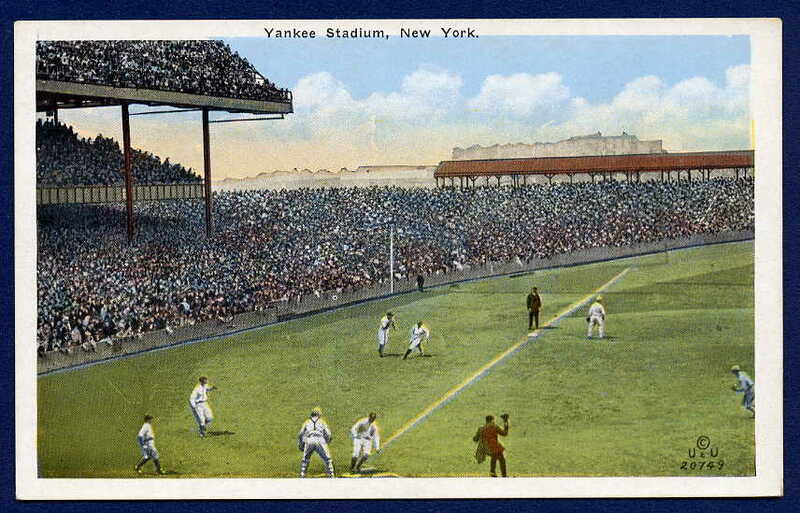 A wonderful in-action image of Yankee Stadium's third base line and another Haberman's postcard. This postcard reproduces an Underwood & Underwood photograph, like some contemporaneous strp card issues. 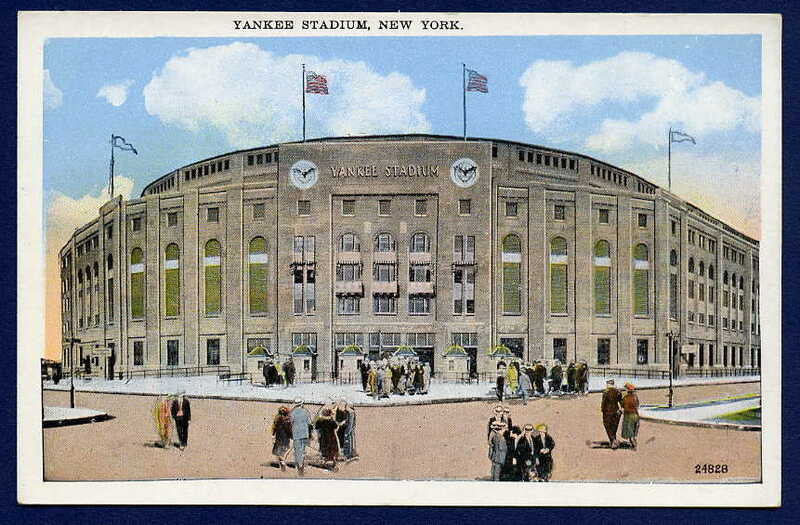 This postcard is the first of the Yankee Stadium linens, issued in the 1930s by the Manhattan Post Card Publishing Co. and depicting the old centerfield scoreboard. This image was re-used well into the 1940s. 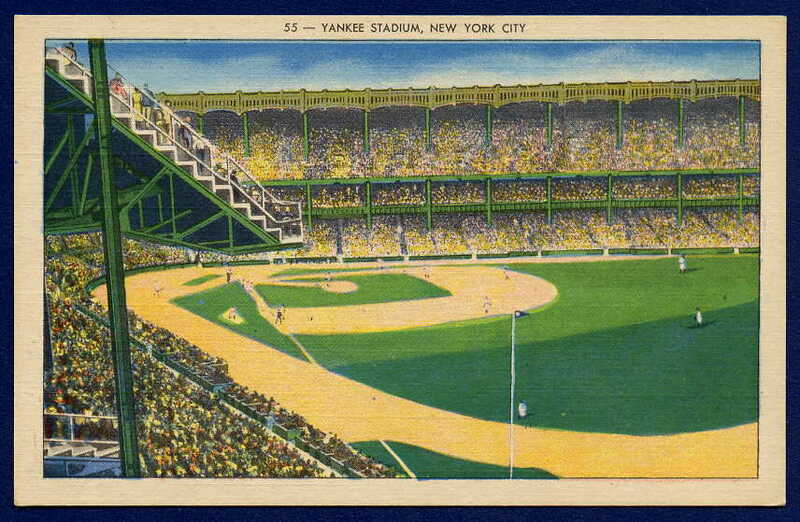 A great non-linen card purchased during the 1941 World Series at Yankee Stadium. The photo is from Brown Bros and the card was issued by Manhattan Card Co. This specimen was purchased on Oct. 2, 1941. A great card of the Yankees at Spring Training in St. Petersburg, "The Sunshine City." This postcard was published by Sun News Co. and features Lou Gehrig in an inset. The card was actually manufactured in Milwaukee by E.C. Kropp Co.
One thing is for sure...this postcard was issed in 1950. The card, issued by Alfred Mainzer inc., using the Curteich Art Colortone process, makes note on the reverse that the team "won 13 World Series." In 1950 they won their thirteenth. By the end of 1951, the Yanks would make it 14. Yet another Manhattan Post Card Co. linen postcard. 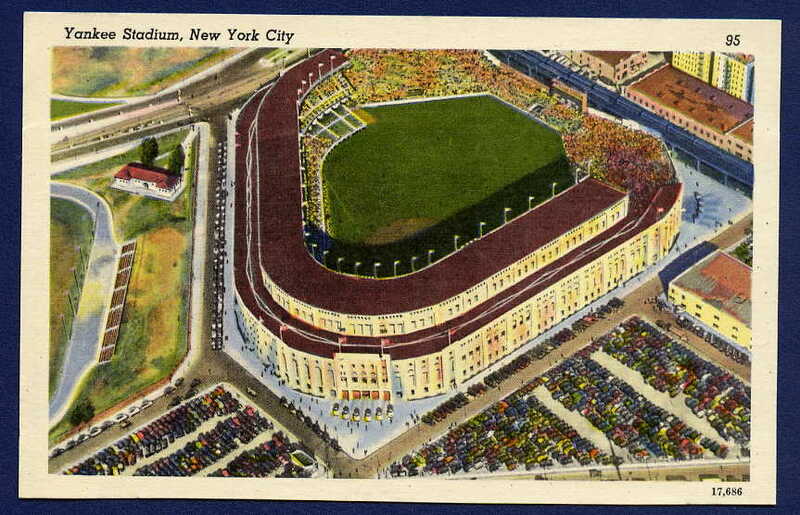 This shot of the stadium was taken from above before night baseball came to the Bronx. While this image also was captured prior to the invasion of night games at Yankee Stadium, this card likely was released in the 1940s-1950s, by the Acacia Card Co.
From 1901 through 1908, Columbia Park was home to the Philadelphia Athletics, co-owned by Ben Shibe and Connie Mack. 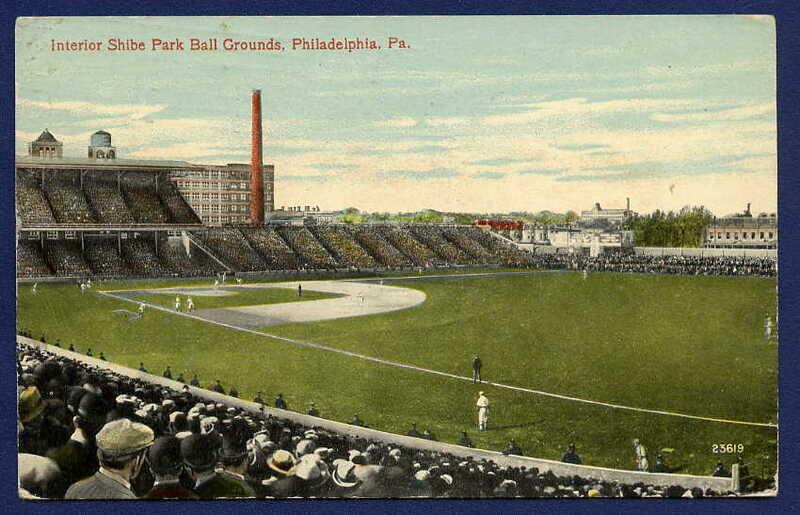 Awarded a Philadelphia team in 1901 in the upstart American League, the two had this park built in only five weeks, in time for Opening Day. 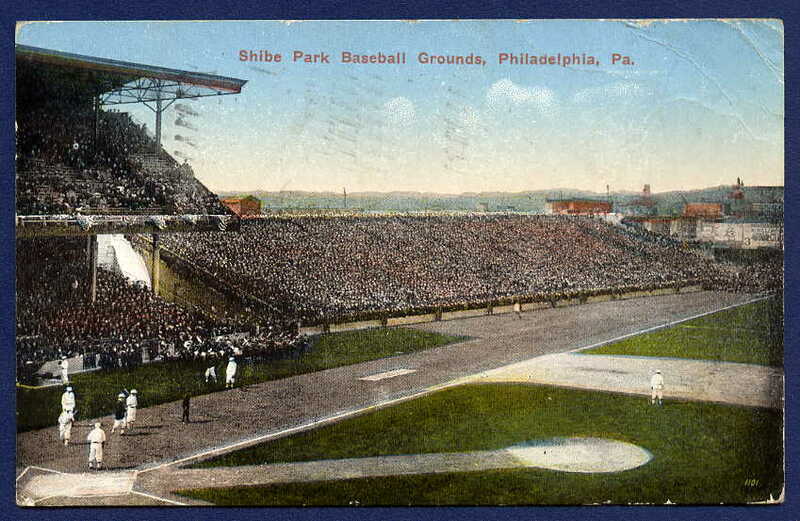 Postmarked in 1915, this card showcases the third base line, pitcher's mound and grandstand at Shibe Park. A classic and colectible pre-linen interior image. 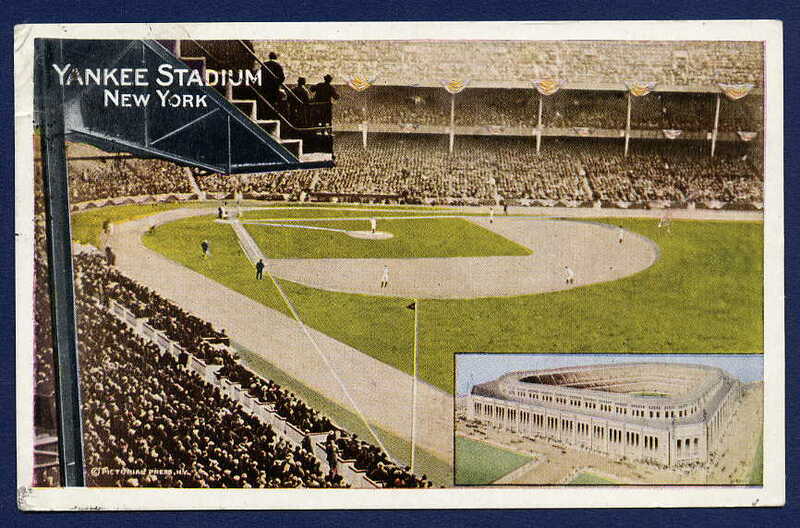 This card features a different interior image that even captures the smokestack beyond the third base-side grandstand. Published by The Post Card Distributing Co. and postmarked in 1913. 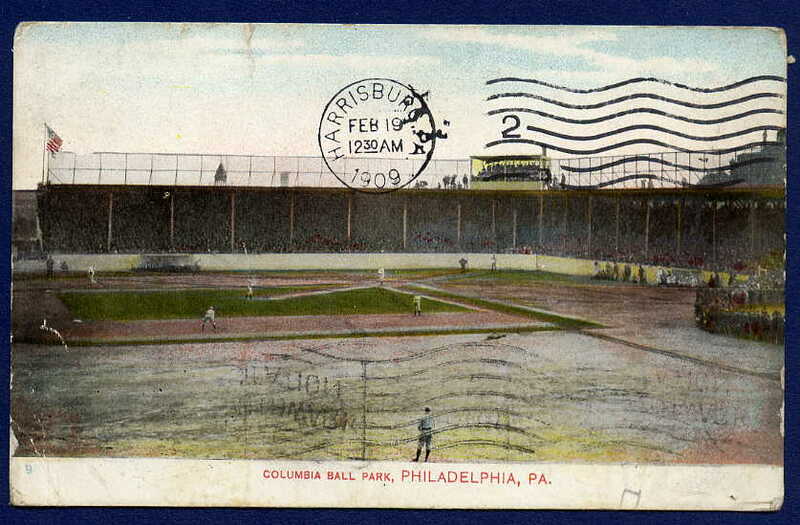 This postcard was issued by A & S, with this specimen postmarked in 1909, the very year they moved to their newly-constructed Shibe Park, where they would play until the franchise was moved to Kansas City many decades later. 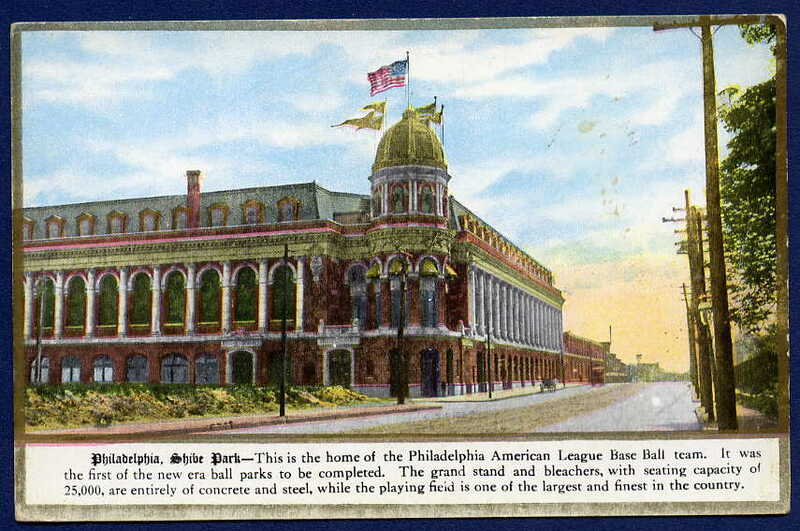 Opening in 1909, the grand structure that was Shibe Park made its way onto postcards a year before it opened, in the form of artist renderings. 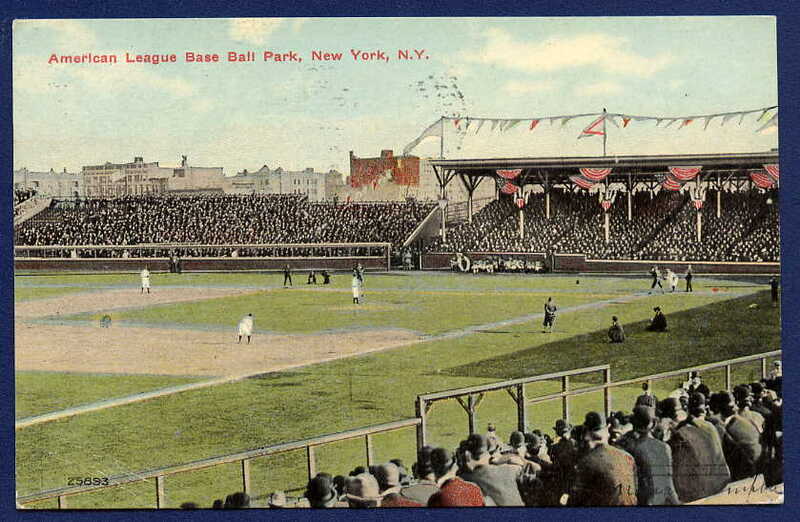 This postcard was published shortly after the park opened by The Rose Co., better known among baseball collectors for their embossed 1908 palyer postcard series. Featuring gold foil, this card proudly boasts: "It was the first of the new era ball parks to be completed...entirely of conceret and steel." A scarce postcard, this issue featured an image that could be found on other cards without the white text box and foil. 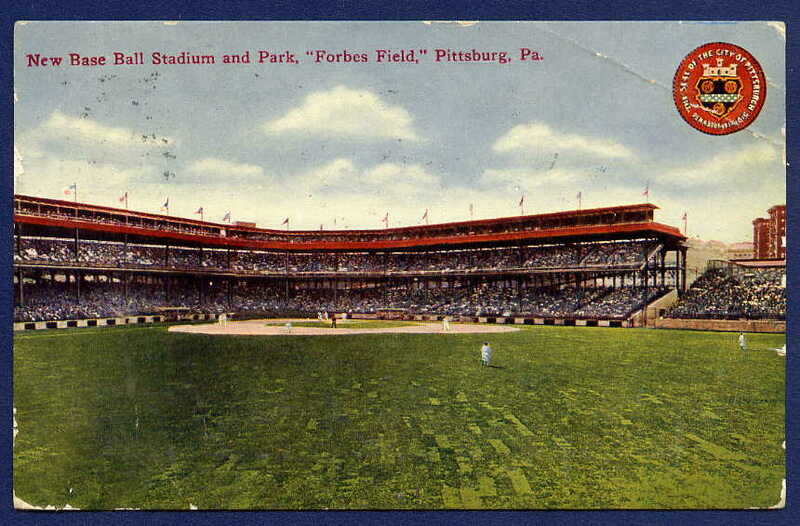 Prior to the construction of Forbes Field, the Pirates played at Exposition Park -- but you couldn't tell it from this card. 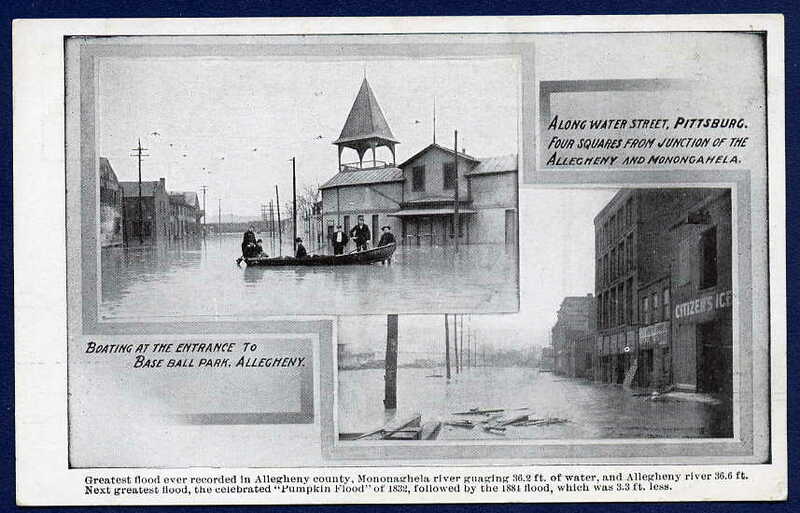 In July 1902, flood waters climbed so high, fans were boating outside of the park's entrance. The construction of the concrete and steel Forbes Field, yielded a flurry of postcard activity, This card of the "new ball park" features a seal of the city and was issued by The Acmegraph Company, Chicago. 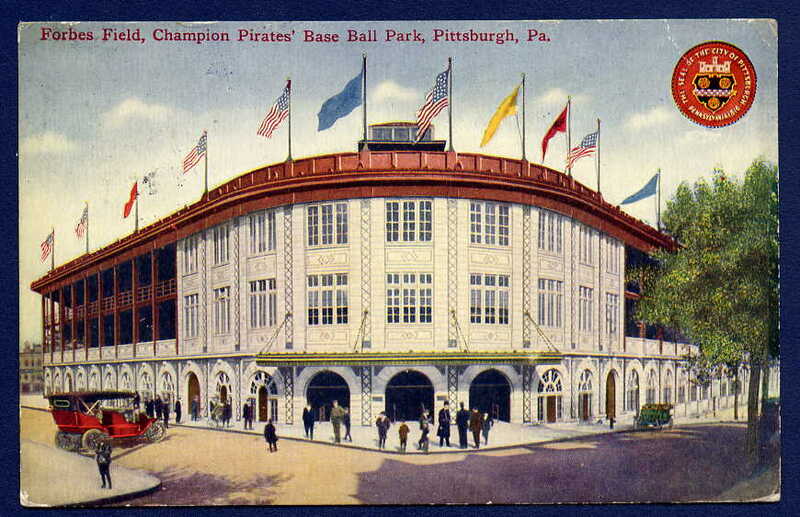 Another card with the seal of the city, this postcard was made by the Fort Pitt Publishing Co., and celebrated the "Champion Pirates Base Ball Park." 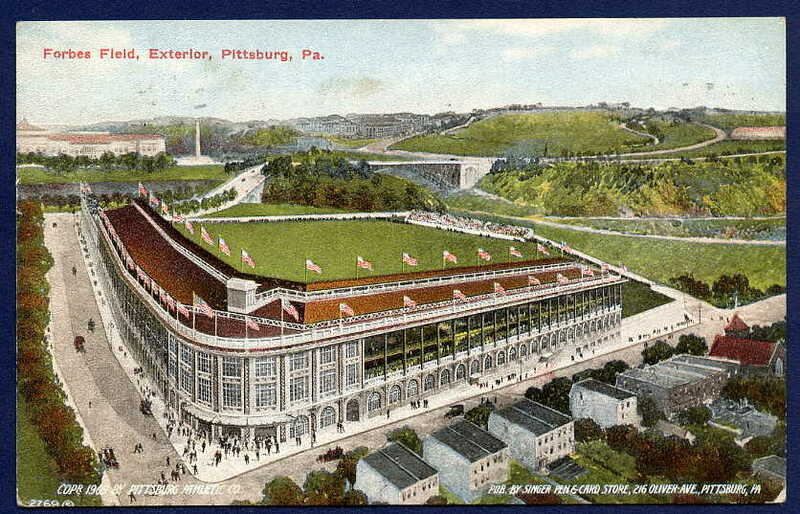 A woderful scarce card published by the Singer Pen and Card Store in 1909, this card features yet another exterior image of the new ballpark, taken from another angle. 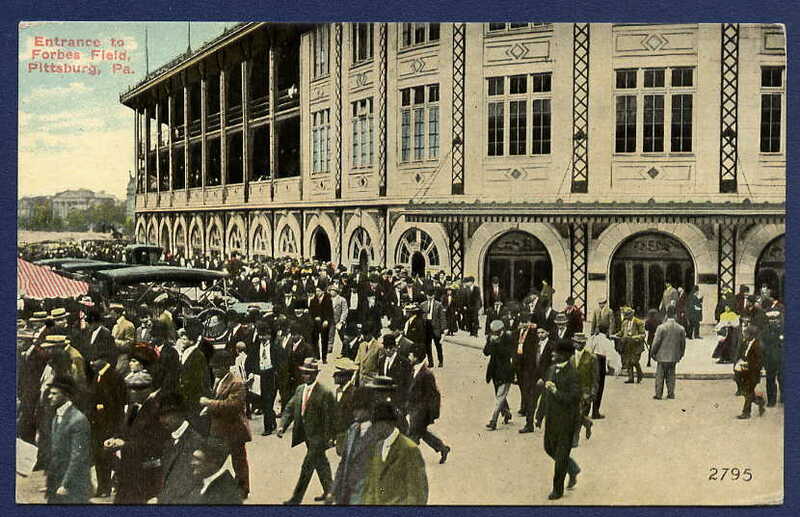 This hard to find pre-linen postcard showcases the teeming crowd at the entrance to the new Forbes Field. This postcard features virtually the same image as the Acmegraph card above and the one at the bottom of the right column. Photo ad Copyright by Chataqua Photographing Co. and published by I. Robbins & Son. Postmarked 1913. 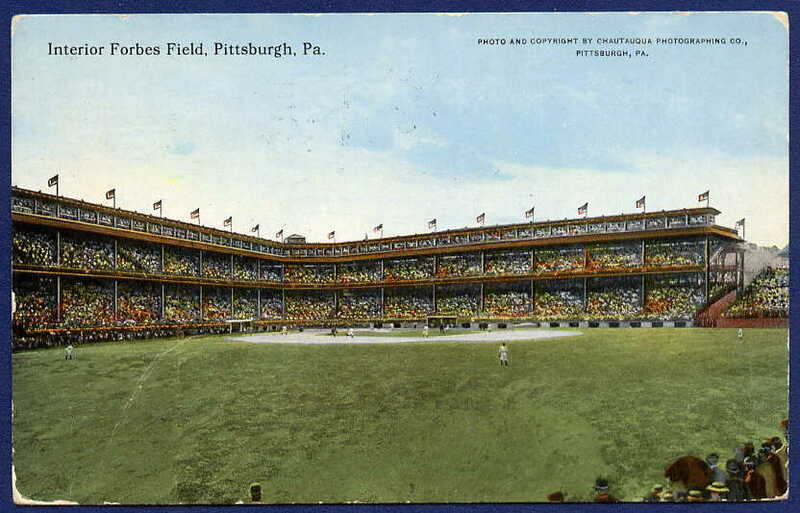 Pre-linen interior postcard of "Forbes Field and Base Ball Stadium," the crown jewel of Pittsburgh. 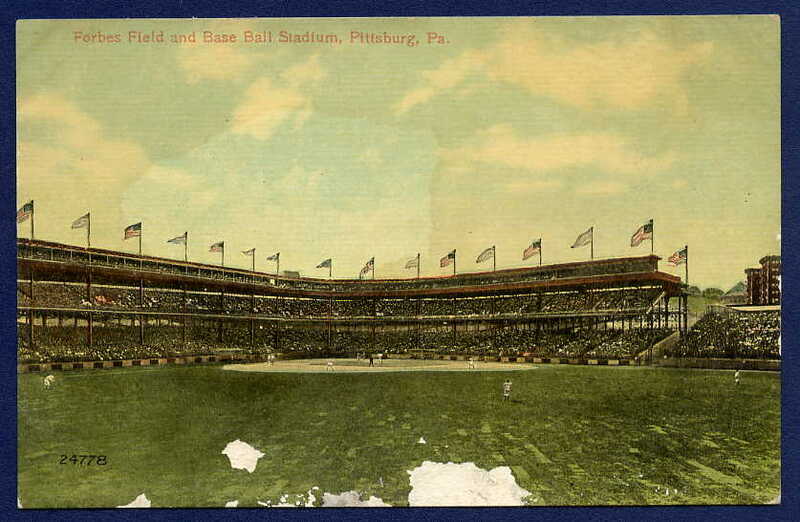 Published by the Publishers Circulation Promotion Association, this scarce postcard captures the highs and lows of the 1902 baseball season in Pittsburgh. On July 4th, with the water still in the park, the PIrates sloshed through a doubleheader against Brooklyn.